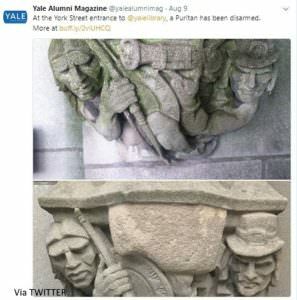 Officials at Yale University recently censored a stone work of art on campus depicting an armed Native American and Puritan side by side, which has been described as a “hostile” image by the Ivy League institution’s alumni magazine. The stone carving was edited to cover up the Puritan’s musket, while the Native American’s bow was left as is, reports Yale Alumni Magazine. The decision to censor the carving was made by both head librarian Susan Gibbons and Yale’s Committee on Art in Public Spaces, the latter of which advises President Peter Salovey “on ways to better represent the diversity of the Yale community through the art and other symbolic representations found around campus,” according to the university’s website. The censorship of the school’s historic stone carving marks one of the first major accomplishments of the newly reconstituted art committee, which was charged in April 2016 with undertaking “an inventory of public representations … throughout campus,” according to Salovey. The committee was tapped with the job after a Yale employee smashed a stained glass window in a Calhoun College dining hall depicting slaves carrying cotton. In another of its first decisions, the art committee selected additional windows to be removed from Calhoun College and “conserved for study and future exhibitions,” according to Salovey, who added the windows would be replaced with tinted glass as a placeholder. As for the carving, its “presence at a major entrance to Sterling was not appropriate,” Gibbons told Yale Alumni. The decision comes on the heels of the Committee on Art in Public Spaces’ public call to the campus community to weigh in on the institution’s art, including posting an online form on which people could lodge complaints and suggestions. 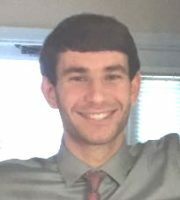 The effort was touted on the university’s website as part of “A More Inclusive Yale” campaign. It is unclear if any students or faculty had concerns about the musket carving. Archives of the student newspaper, The Yale Daily News, list no news record of any such complaints. A number of universities in recent years have censored or concealed art on campus. Earlier this year, Pepperdine University removed a Christopher Columbus statue from its grounds while late last summer the University of Wisconsin-Stout moved a painting of Native Americans and French frontier trappers from a public area to a private conference room. The art in these two cases was deemed “painful” and “harmful,” respectively. Gibbons told the alumni magazine the stone slab installed to cover the musket could be taken down without damaging the original musket carving. A bow held by the Native American figure in the carving remains uncensored. It is unclear why officials decided to cover the musket while leaving the bow untouched, or why they deemed the artwork inappropriate in the first place. The College Fix reached out to Yale media relations with two emails and a phone call, but the office did not respond to requests for clarification. Meanwhile, the art committee is also working on adding pieces that honor Native Americans and increase the depictions of women in campus spaces, Yale News reports.